Most of my knives are from the 1960s and up. I do have information on most stampings used and if you have any question just send me some pictures. Today i will show you some pictures of stampings used on the tang. These are on the main line if we should call it so. 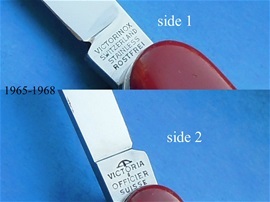 On the righ is a picture with information and it is on a knife from 1970. This stamp was also used before 1968. You will have to use the functions and construction to date it before 1968. 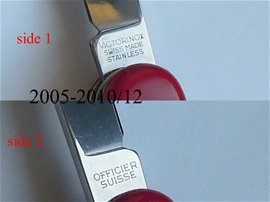 Take notice of the small v in victorinox. There are production variations during this period as well. It is so on most knives made from the beginning in 1884. Now we see almost the same stamp as above. Notice the Big V in Victorinox. This stamp may be the most common. 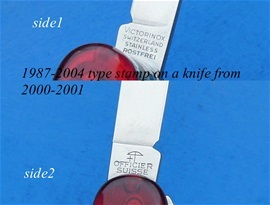 Remember that on all stamps ever used by Victorinox you will find production variations on them. Also remember wear from use and also some mistakes in the production can happen. Now we are in the most modern time and changes. Notice the big V in Victorinox. No crossbow. 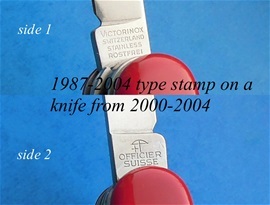 This is the stamp used today and notice the small v. The changes from 2004 includes a stamp used on most blades and categories. Also remember that knives made for advertising may vary on the dates. I would also like to mention that i have seen on some stampings that the o letter on some dates got a special variation. There are also one or two more stamps used during 1968 and up. Remember that advertising knives that looks to be the main line with the evolution not always follow the dates. Here is a tang stamp that i believe should represent a knife from the mid 1960s with Bail. The tang stamp used is the one i shown 1968-1974. I did mention it was used before 1968. It was probably used from the early 1960s as well. We are still on the 91mm line. Here is a stamp that is a bit interesting. 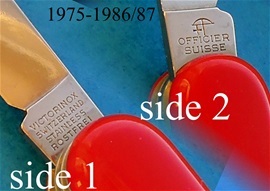 I do not call it a stamp of its own but just a variation of the type used from 1975-1986/87 and 1987-2004. The difference on this is the crossbow line that touches the letter c. This you can see on the small v and big V knives. So far i have not found any special reason for this. Maybe it was a type with a special meaning for some applications? I looked on advertising knives and the main line. I cannot find any system for it and therefor it may be just a production variation. On some tang stamps it looks like the crossbow line touches and you may need a magnifier. 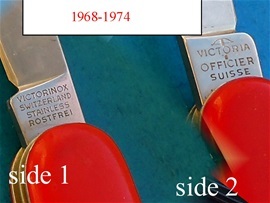 On the picture on the right is on a knife from 1980-1985. You can see the line and the C touches. On a knife with a big V from 1994-1999. The line and C got a distinct touch. It is an advertising knife but there is no possible way for me to say if this touch is used for some applications systematically. Then i wondered if this is a stamp evolution that it is the idea for the tang stamp to have this touch and if you use a magnifier it seems the cross also changed. I have seen on knives after the dates mentioned here that the line does not always touch and it may or not on many knives. It is interesting to research! 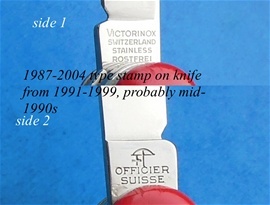 I believe there are small differences made by Victorinox and small differences that are unavoidable because of the production and new stamp modules made. It is not so that you can use the tang stamps alone for a identification. You need to know the evolution of the functions and categories. If you cross check the evolution, stamps, functions and milestones then you should get a result. 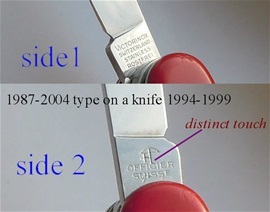 On the right is a picture of the knife 1994-1999 with the distinct touch. 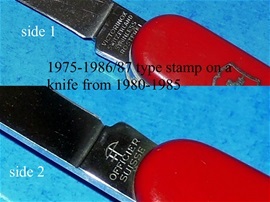 On the right is a picture of the 1987-2004 type tang stamp on an advertising knife. This is on the main line as well. It does show an interesting variation. It is not easy to take pictures of tang stamps but it should be enough. The cross does not touch! This is a very important detail. Here is a stamp that seems like the 1987-2004 type but i do believe this to be a stamp on its own. This is because it is on a very special knife for military service. 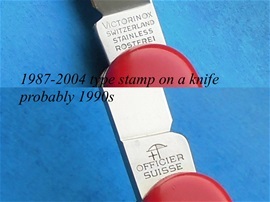 I do believe the stamp to be an original Victorinox type. It is very difficult to show the letter O on a picture. The whole O is stamped into the metal and not just a ring O. One detail that people should not forget about is the crossbow and the letter C placing. You can see on the knives you have how the letter C and the line are placed. 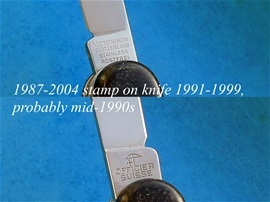 This is a 1987-2004 type stamp but on a knife from 2000-2004 with production variations. Here is an example on the depth of the letters and how distinct the crossbow symbol is. I am not sure if this is done on purpose or if it is like i believe production variations and the different stamp modules made. The crossbow is more distinct. The letter C and the crossbow touch, not so easy to see on the picture. It adds to the flavor all the variations. There is for sure an evolution on the 1987-2004 type stamp. The separate cross, line and other details are part of the evolution. On the picture to the right is a very nice edition of the last type used close to the new stamp in 2004(without the crossbow). This is on the Cybertool 34 that I did buy in 2002 and therefor I can date it 2000-2002 and most likely this is part of the 2001 batch made. 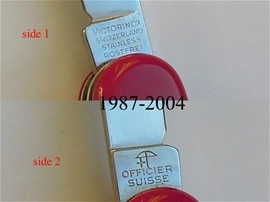 On all the 1987-2004 type variations that you can see on the main line stamping page the production variations are there and probably there could be things done for the protection of the Victorinox products. For sure the emblem and tang stamp is very important on a SAK. This is the identity of it and the evolution is there for it. It is very interesting for me looking on all the small details and I get the feeling that there are some small variations done for the further protection of the products. I am rather sure it is so. I am also rather sure many small differences are only production variations. I do believe there are more facts to be found on the 1987-2004 type without a doubt. One thing is for sure that production variations can be found on batch to batch and the depth of the stamps with small details are because of production variations. What is the main line of knives is also sometimes difficult to be sure about because of special products and knives for advertising. The 1987-2004 type used on the 2001 CyberTool 34 is very even and with nice details. The small spot at the crossbow is from use. 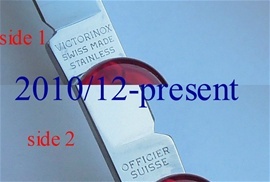 This tool represents a very innovative introduction by Victorinox. It was introduced from the year 2000. There is also a small detail on the letter O on this stamp that is interesting! According to my observation change from touched cross to separated cross happened aprox. in 1994. Letter me and I'll send you evidences.